This table contains the primary data used to create the results in the article "Primary productivity is related to niche width in the Australian Wet Tropics" in Global Ecology and Biology. It represents 510 ecological plot sites in the Wet Tropics. It contains columns for gross primary productivity (GPP_0112), rainfall (RAIN_0112), temperature (TEMP_0112) and the mean (MN), median (MD) and standard deviation (SD) in niche widths (NW) of tree species recorded at each site. See the methods sections in the GEB article for more details. Aim: A key ecological debate is whether ecosystem functions are distinctly influenced by biological diversity across broad scales. 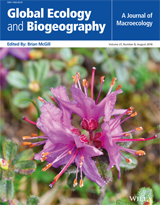 Although recent work has emphasized the importance of links between ecosystem functions and measures of ecological specialization as proxies of biodiversity, few studies have analysed macroecological relationships empirically in diverse environments. We tested whether gross primary productivity (GPP) in the Australian Wet Tropics (WT) was distinctly related to community‐level measures of the ecological specialization of component tree species across climate space, after accounting for climate drivers. Location: Wet Tropics, Australia. Time period: 1976–2012. Major taxa studied: Nine hundred and forty‐eight WT tree species. Methods: Using all geographically valid herbarium records for WT trees, we quantified the realized climatic niche widths using continental surfaces for maximum temperature of the warmest period and total annual rainfall. The median realized niche width for all tree species occurring at 510 sites was used to approximate ecological specialization within communities. To separate climatic effects on GPP, we applied a novel analysis using the difference in GPP and the difference in median community realized niche width between site pairs with similar climatic conditions. Linear models were then run on the difference in GPP between site pairs (response) and the difference in climatic niche widths (predictor). Results: For climatically similar sites in drier areas, GPP was higher in sites composed of species with narrower temperature niches (average R2 = 0.087, average t‐statistic = −3.45). Conversely, for climatically similar sites in drier areas, GPP was lower in sites composed of species with narrower rainfall niches (average R2 = 0.171, average t‐statistic = 5.06). Main conclusions: Wet Tropics sites with more thermal specialists had higher productivity, whereas sites with more moisture specialists had lower productivity. These findings suggest that physiological specialization across climate space can influence primary productivity at broad scales, but in inconsistent ways.